Based on Proverbs 29:25, this message will help you get out of the wilderness and into the Promised Land that flows with the blessing of God! Based on Proverbs 29:25, this is one of our most popular (and powerful) messages. Jesus said, “If you are ashamed of Me before men, I will be ashamed of you before My father in heaven.” The fear of man is a trap. It was the fear of man that kept the Israelite’s from entering the Promised Land! 1 Cor. 10 says, “These things (the Israelite’s not entering the land) were written for our example and our instruction.” God didn’t want the church to make the same mistake they did, and we are! This is also one of the main reasons the unregenerate reject the Gospel, even when they know it’s true. On this CD you will learn how God can deliver you from this sometimes subtle, sometimes blatant form of idolatry! This is one of the main reason many Christians never experience the abundant life that Jesus speaks of. Originally taught before a church of 3,000 there were 940 requests for copies of the message. Many were delivered, many were crying in repentance. 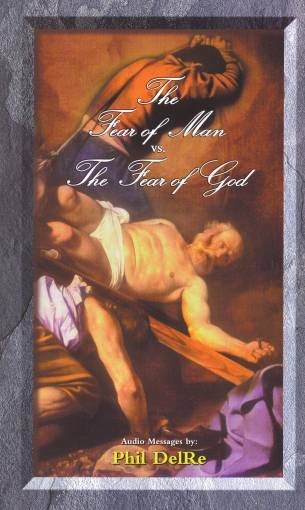 Be the first to review “The Fear of Man vs. The Fear of God mp3 audio” Click here to cancel reply.